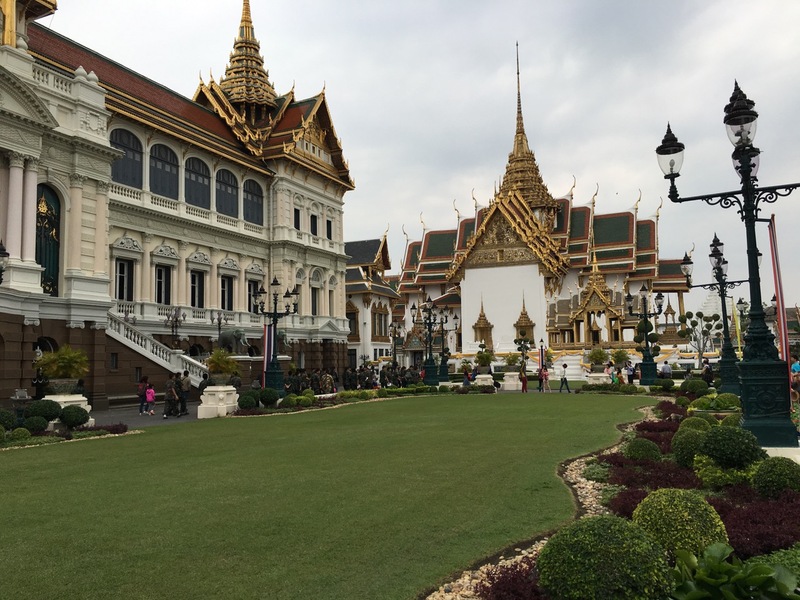 The last tourist attraction we visited during our month in Bangkok was The Grand Palace. It’s probably one of the first places most tourists visit, and for us it was the last. Maybe that tells you something about our time in Bangkok overall. We put a lot higher priority on exploring different parts of the city than we did hitting the big sightseeing locations. 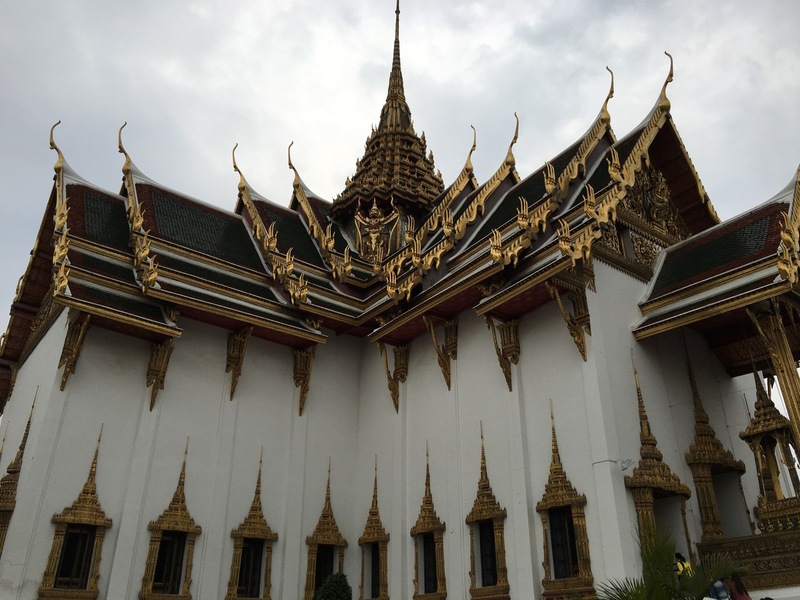 The Grand Palace in Bangkok is a complex built by one of the previous kings of Thailand, after the capital moved from the west side of the river to the east. 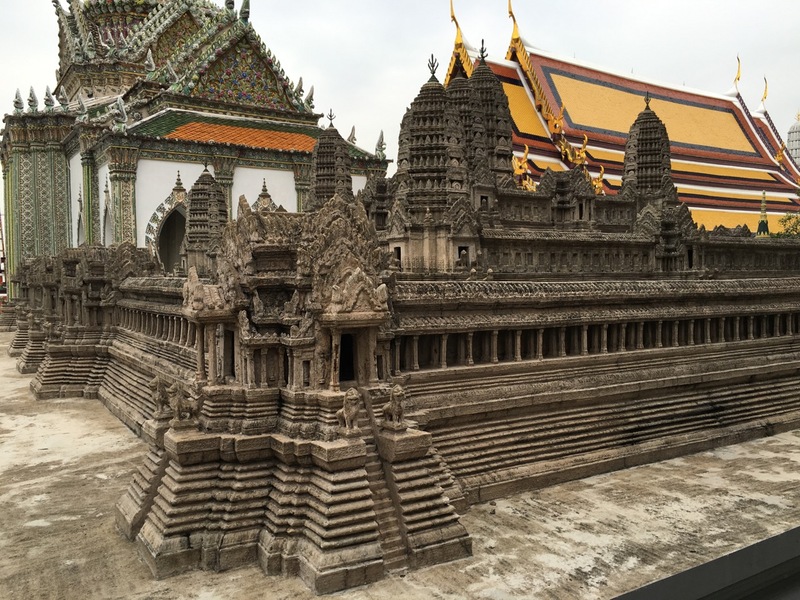 It includes a temple (which houses the Emerald Buddha), palaces, and governmental buildings. It started with just a few buildings, but they just kept filling in the empty space in the area with more and more buildings until it was very crowded. The king wasn’t happy because the breeze that used to exist here was now blocked by all the buildings. So the king started spending more time in a city to the north that wasn’t so crowded. Realizing this was kind of a dumb approach, since Bangkok is the capital after all, the king had another palace built in a new location in the city. At that point, the royal family moved there. And then later, the monarchy’s absolute rule was replaced by a democracy. 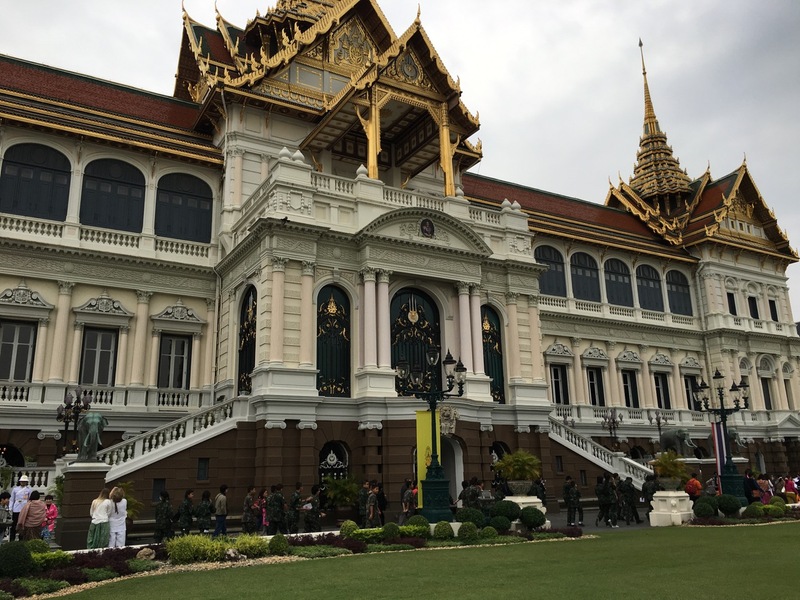 At that point, the king was no longer the head of government, so the government moved all the government functions out of the Grand Palace area as well. That left the complex with a palace that the king no longer lived in, and a bunch of government buildings that were no longer used by the government. So now it’s mainly a place for tourists to visit. I had read lots of advice online that you need to get to the Grand Palace really early to avoid the crowds and the heat. Fortunately, there was a cold snap while we were there, so the heat wasn’t an issue. But still we wanted to beat the busloads of Chinese tourists, so we set out as early as we could by express boat, headed north. After the second or third stop of the express boat (a water bus), it was clear something was wrong. I don’t know whether the boat had serious mechanical problems or if the driver was really bad, but it took him several tries to dock correctly with the pier to let people off. And black smoke was pouring out of the back of the boat. A couple stops in a row, the driver hit the pier with such force that the passengers all were shaken around and I was afraid the boat might break or bend or something. By the second time this happened, Beth was getting really nervous, and so we hopped off the boat prematurely. We went to a Starbucks, I had a cappuccino, and we used the restrooms. After regaining our will, we got back on the next northbound express boat. This one worked fine, and we were soon at the right place. A short walk from the pier led us to the entrance. We didn’t get hassled by tuktuk drivers or any other scam artists. We bought our tickets (500 baht each), rented two audio tour players, and were soon on our way. A funny thing happened over the course of our several month trip, and I guess I might as well talk about it now. I took my new Panasonic GH4 camera on this trip, with a couple of microphones, a couple lenses, and related basic accessories. My original plan was to shoot some 4K video and get as many nice still photos as I could. The camera is smaller than almost all DSLRs, as it uses what’s called a Micro Four Thirds format lens system. But with all the stuff – and even without – it still weighed a fair amount, and meant that whenever we went somewhere I had to take my backpack to put it in with all the stuff. But I realized once we got to Agra, India, that the people who were tuned into these blog posts liked the photos I was taking from my iPhone 6s just as much as the photos from my GH4. So I started alternating them. Some outings I’d take the GH4, some outings I’d just take my mobile phone. And then toward the end I was just taking my phone. That’s why these pictures of the Grand Palace are from my phone. In fact, all the photos I took in Bangkok were from my phone. My expensive camera just sat in the camera bag in our hotel room the whole time. In hindsight, I might have saved the hassle and weight on this journey by not even taking a “real” camera with me. Maybe I’ll do a “lessons learned” post later and touch on that. 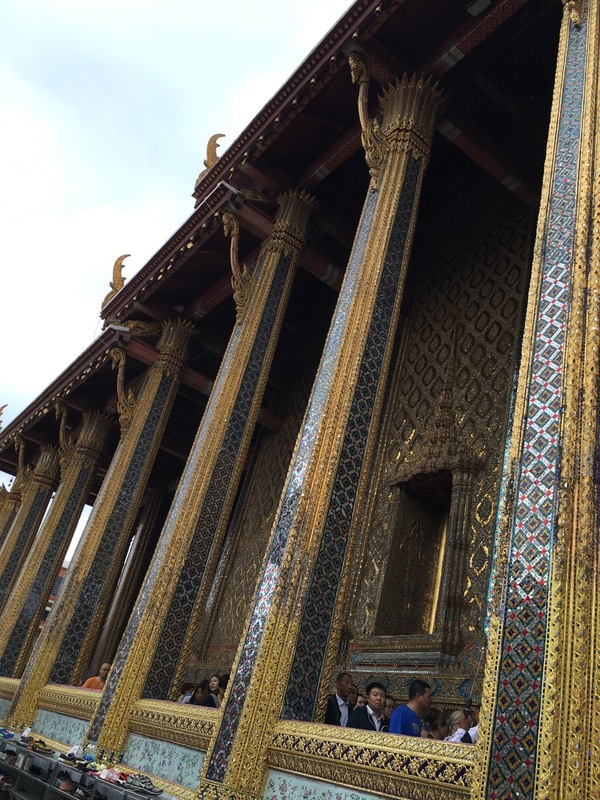 Most of the time we spent at the Grand Palace was what they call the “Temple of the Emerald Buddha“. 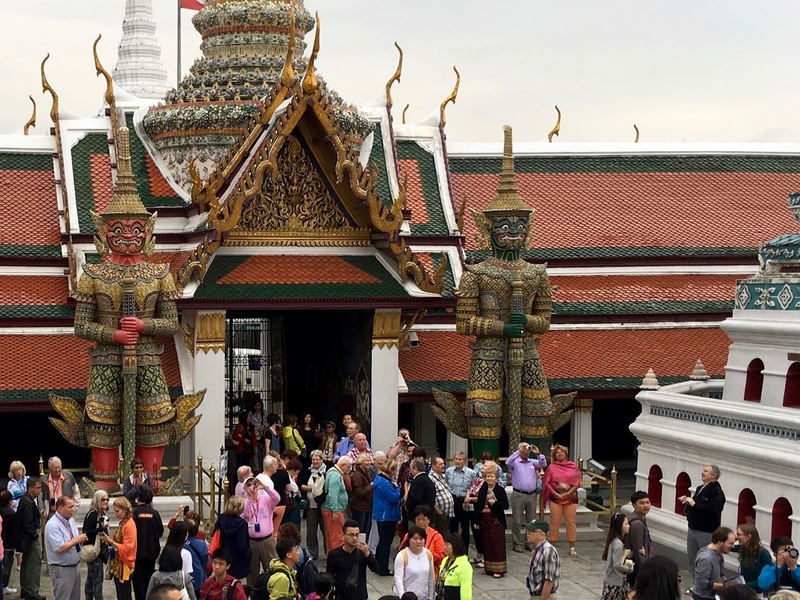 The Thai name is Wat Phra Kaew, and it is the most sacred Buddhist temple in all of Thailand. I guess that’s because the Emerald Buddha is the most sacred object in Thailand. There’s a lot to see in the temple area. Here are my photos. 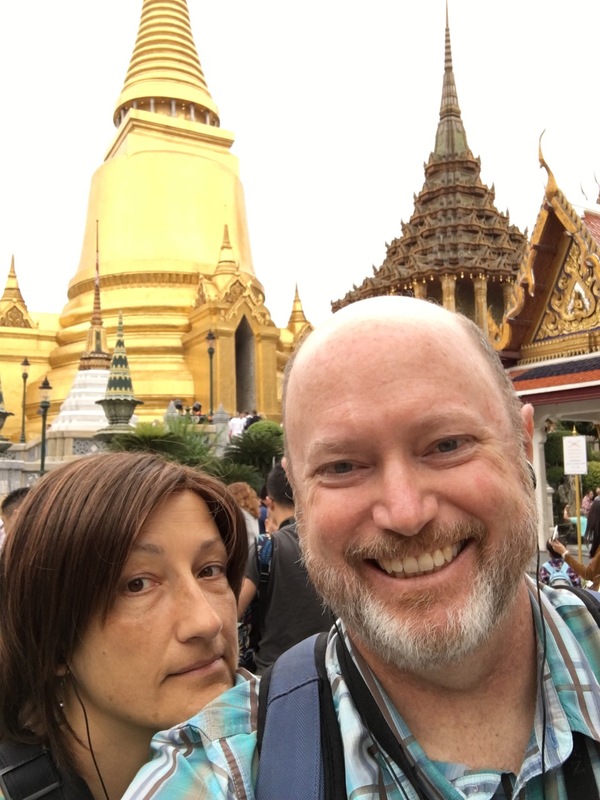 Here, Beth and I stand in front of the golden stupa called Phra Sri Ratana Chedi. It is said to contain some of Buddha ashes. Here is a miniature model of Angkor Wat that the king had made. I guess having a model of the real thing makes it so the Thais don’t feel compelled to go to Cambodia (a long time enemy) to see the real thing. I loved these two statues of giants that guard the entrance to the temple area. There are several of these giants all around the grounds, and there are a pair of giant statues like this at the Bangkok airport. Buddha is for respecting. Not furniture. Not tattoo. Here you can make offerings, but I took the photo to show the message on the umbrellas. 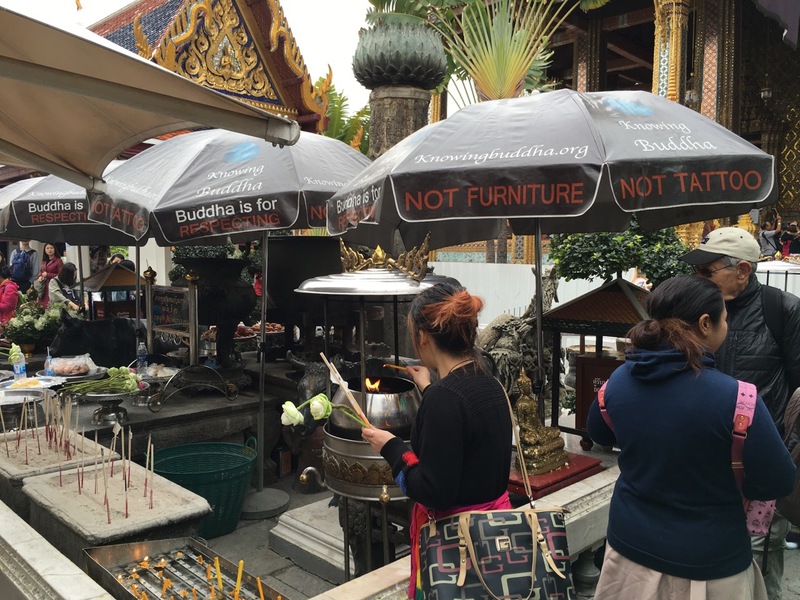 A lot of tourists visiting Thailand take home tattoos of Buddha or furniture or other trinkets, not realizing that it’s disrespectful. The Thais look at Buddha tattoos sort of how you might expect the Italians to look at Jesus Christ g-strings. Here’s where we took our shoes off before entering the temple. Unlike the Sikh gurdwaras we’d visited in India, there was no attendant to guard your shoes. But nobody took mine. This is the outside of the main temple. 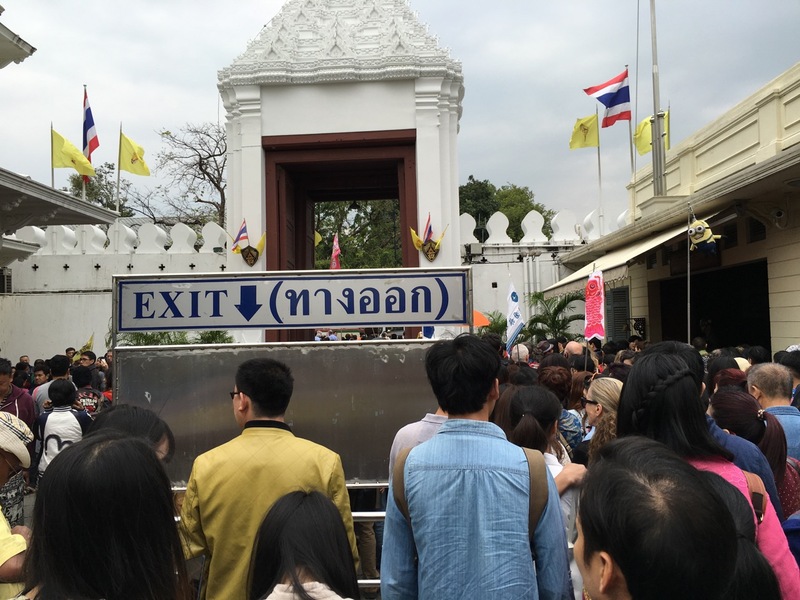 The people are lined up outside to get inside and have a chance to see the Emerald Buddha. I didn’t actually take a photo of the Emerald Buddha. Nobody is allowed to. A very stern security guard will stop you, grab your camera, and yell at you if you try. I know, because a Chinese tourist near me tried. It doesn’t really matter, though, because you can’t get close enough to it to get a good photo anyhow. Here is a photo from Wikipedia, so you can see what it looks like. The Emerald Buddha isn’t actually made of emerald. “Emerald” in this case just means that it’s green. It’s actually made of jade. This great building was designed in European style at the time when Thailand first started to become modernized. The architects originally designed it with three European style domes, but advisors to the king suggested they be replaced with something of a distinctive Thai style, and that’s what you see here. So the building is a nice mix of Western and Thai architecture. It’s used for big state functions still. Most is off-limits to tourists, though there’s a weapons museum in the lowest level. 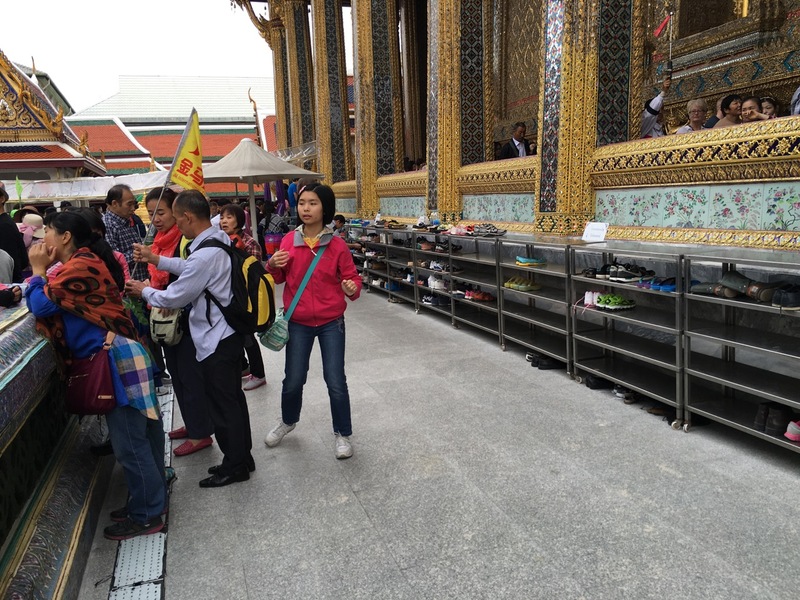 After seeing the Buddha, we left the temple to see the rest of the Grand Palace area. There are a few of the government buildings to see. In this photo, the big European style building is on the left, and to the right is one of the king’s palace buildings. Like I said earlier, no king has lived here since the royal residence was moved to a different palace in 1925. Close-up showing the Thai style roof. Look closely at the corner where the two parts of the roof come together. There is a statue up there. I think it’s a deva. And that’s all she wrote, as the saying goes. You can see from the crowd of people leaving that even though we beat the worst of the rush, it was very crowded there. No, the exit isn’t down from the sign. For whatever reason, the downward pointing arrow means “keep walking in this direction”. After leaving the palace complex, we stopped for some much deserved lunch, and then caught an express boat back to the Central Pier near our hotel. Though the excursion took about six hours total, we were only on the Grand Palace grounds about two hours of that. If you see the Buddha on the road, kill it.